Facebook have been under pressure in recent years from all angles to make privacy options simpler and quick to change. They’ve actually done quite well at this, considering how complicated the Facebook privacy 10 Solid Tips to Safeguard Your Facebook Privacy 10 Solid Tips to Safeguard Your Facebook Privacy Read More system is overall. However, for those of us who understand the privacy controls well, there are a number of things Facebook could implement to improve the effect of privacy controls 6 Simple Tips To Protect Your Privacy on Facebook 6 Simple Tips To Protect Your Privacy on Facebook Read More . When you’re trying to balance workmates, friends and family, there are a number of important Facebook privacy concerns to keep in mind. Most regular Internet users are fairly good at balancing these needs, protecting privacy where possible and even separating their social network usage into different accounts for different audiences. But if social networks want us to use just one account for all audiences, they need to offer sophisticated privacy controls for us to manage our accounts. Here’s an important privacy option Facebook should implement. At the moment, Facebook allows you to limit who can see posts and photos you’re tagged in on your timeline How To Control Your Privacy With The Facebook Timeline How To Control Your Privacy With The Facebook Timeline While the new Facebook timeline looks fantastic, there are a few privacy concerns worth keeping in mind. For most people, certain things will need adjusting before you can be completely sure that your posts aren't... Read More using friends lists (if you go into Privacy > How Tags Work and change your maximum visibility – Read the Facebook Privacy Guide to learn about friends lists). It also allows you to veto the tags before other people see them. So most sensible people use a combination of these tools to ensure workmates and grandparents don’t see drunken party photos. But this is still very limited, since that tag privacy setting is set just once for everything you’re tagged in, including photos and location posts (once enabled). Any other privacy controls on those photos are controlled by other people. Your acquaintance tags you as being with them at a new restaurant. You’re happy for all your friends to see this as it’s nowhere near your house and you feel that it’s safe. You set your tag privacy to “Friends“. Your best friend tags you as being with them at your favourite café. You don’t want to be stalked by acquaintances, so you now decide to set your tag privacy to “(Close Friends OR Family OR Workmates) NOT (Acquaintances)“. Your aunt tags a photo of you as a kid. You’d like your relatives and a few good friends to be able to see those photos, but not your workmates or acquaintances. She’s set her album to ‘Friends-Only‘ and ‘Friends of Anyone Tagged’. You now need to set your tag privacy to a custom-made setting of “(Close Friends OR Family) NOT (Acquaintances OR Workmates)” in order to maintain the privacy you want. Even if she had more private settings in place, you would probably set your tag privacy like this just to be sure. Your high school friends tag photos of you at parties as a teenager. You’d be happy for your high school friends and current good friends to see these photos, but no-one else. You now need to further restrict your tag privacy to “(Close Friends) NOT (Family OR Acquaintances OR Workmates)”, basically omitting the family. And this now applies to ALL of the above posts. This means the only relatives who will see your aunt’s photo are the ones who are Facebook friends with your aunt. The random restaurant tagging by your acquaintance can now only be seen by the restricted selection of people, too. Thanks to the restrictions desired for certain types of photos, anything you’re tagged in needs to be restricted in this way. The only alternative is to veto all photos and ensure these photos are never tagged in the first place. Facebook has cornered us into restricting everything or vetoing everything and limiting what we approve. When someone in my ‘Family‘ group tags a photo or post of me, show it to “(Close Friends OR Family) NOT (Acquaintances OR Workmates)“. When someone in my ‘Workmates‘ group tags a photo or post of me, show it to “Friends“. Obviously, simple controls need to be maintained also so that everyone can find a solution for them which is easy to understand. It’s no wonder so many people have multiple Facebook profiles, despite it being against Facebook’s policy. If they want people to follow the rules, they need to make it possible for users to control their privacy in as many ways as possible. Which privacy control do you think Facebook should improve? How should it be changed? Commenting on internet is good but do something that never before any body has done, i read your most of the blogs, you look deep into things, make it to solve it on a broad level. thanks. You know, this is probably exactly what Facebook are thinking. You're right. I just made these, I couldn't rsiset substituting custard powder for cornflour and they are just wonderful I like the fact they are so light and small, the problem with most Yo-Yos/melting moments is that cafes and bakeries make them waay too big so you end up with a chalky brick type device which although it is delicious is hard to eat with dignity and far too much. This is one of the only biscuit press recipes I have used that has worked with out many hours of frustrating tweaking. Good work. Mine are resting in a tin to be devoured tomorrow and aside from being rather more yellow, do look and taste just like yours look and you have decribed! 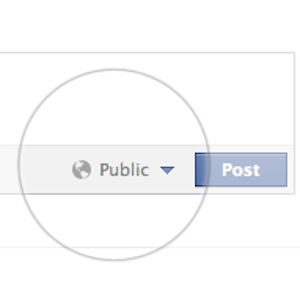 Individual privacy settings for each individual post/photo/tags would be awesome! Quite. And for those who think it's already too hard, the possibility to leave it at some default level of privacy. if a person is that afraid of his acquaintances ,simpy don't add them . your bio speaks for yourself-you just MESS UP . There's no fear - just a need to offer different things to different acquaintances. Facebook could do far better by us, is all. The only problem is if you make the privacy controls more sophisticated, then people are going to complain that they are too complicated! The controls had to be simplified because idiots couldn't seem to work it out. I think they're fine as they are, you can change the privacy controls for individual albums (and photos too I think, not certain). And you have Tag Review to let you manually approve what is shown on your profile. If a certain piece of content is really that much of a problem that you can't control its visibility to be precisely what you want it to be, then just delete it. It can't be that vital can it? They definitely have to maintain simple privacy options, for sure. But I don't think it's wrong to also offer advanced options for those that can handle it. Tag review is all-or-nothing. I can either let ALL my family, friends and workmates see the photo or NO-ONE. The point is really that if Facebook want to encourage more tagging, they'd better let us decide who can see it once it's tagged, just as we can for our own photos. Otherwise, people are just going to lock down their profiles overly in order to cover all the possibilities. I suppose one way to handle Tag Review would be to allow you to set the privacy of the tag before you approve it onto your timeline. And also allow a default tag privacy setting as well. Some of them are there. Not enough! this about Beverly because I know her pllsonaery and just because she is the president of pro-life Ms doesn't mean she is the voice behind it. I know several others who are considered to have more of a voice on this subject than her. God turned her heart away from this evil practice. She is totally against abortion now and will speak if she needs to but thats going way overboard to say she's the voice. Dr. Webb, is a moral and ethical OB/GYN. Thank goodness he is more concerned about the life of a baby than about his bottom line or stepping on toes. He has said that this amendment aims to protect newly formed humans within the field of advanced human technologies such as IVF. I mean, come on, you can't pick and choose what you want people to hear. He also says the consequences of not passing this amendment could leave these embryos as being treated as property and not persons. Do you really want that? Do you really want mass human production, genetic selection, human harvesting, or human trafficking. I guess you wouldn't mind all that considering your immoral perspective. By the way, so you're saying you're all for birth control that is taken after fertilization. Because if you are don't dare say you're pro-life in any form. Let's be clear, I am completely against taking the life of any child. If people want to prevent themselves from getting pregnant fine by me but not after the fact. That would be considered abortion. I don't think you get that. Hormonal contraceptives will not be banned just those such as RU486 that allow a baby to be conceived and expelled. So your information is wrong in saying that hormonal contraceptives will be banned. I cannot even believe I'm discussing this because no matter what these are human beings that have been created by our God and it breaks his heart when someone such as yourself tries to argue that its o.k. in some instances to kill them. NO!!! Its never o.k! This is pure selfishness in every shape and form to be against something that could save over 2,000 babies a year in our state. I would hate to lay my head on the pillow at night knowing that I fought against something that would prevent thousands of innocent lives to be destroyed. I would hate to look my children in the face knowing that I was fighting against something that could potentially kill someone that could save their lives one day. So glad I'm not on your side! I seriously couldn't live with myself knowing the blood of innocent babies was on my hands. but also people with a mix of family, friends and professional contacts where, as Angela says in her post. Excellent point - have tweeted the link to my Tweetpeeps.